One comment you’ll consistently hear about Sprain Brook Manor Rehab is that we are a family and it is our great pleasure to take care of your family as if they were our own. 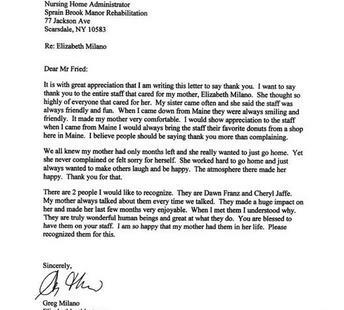 We are only able to do that because of the people who work here day in and day out, many for years at a time.This week we celebrated one of the most dedicated and loyal members of the Sprain Brook Manor family, Elsada Bonnick. Described by friends as a loving, church-going woman who loves everyone, you can be sure that we will miss having her here with us. Elsada provided over 20 years of loving care and service to the patients and residents here at Sprain. While we were sorry to see her time here come to a close, we are excited for her as well. We love you, Elsada! We hope you have a blessed and happy retirement. You deserve it.